GreenFaith has created an opportunity for religious institutions to buy sustainable products at a discounted price. Their inspiration behind this idea is their belief that financial constraints should not hinder environmental stewardship activities. To learn more about Green Purchasing, click here. GreenFaith has produced a guide for sustainable food for religious institutions called Repairing Eden. It outlines food actions that religious schools and houses of faith should consider. They also partnered with the Johns Hopkins Center for a Livable Future to produce the Good Food Toolkit. 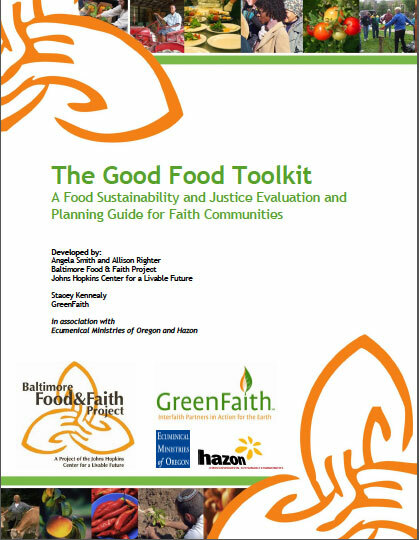 It provides a food audit to assist faith communities in improving their food work. To read or download Repairing Eden and the Good Food Toolkit, click here. JustFaith Ministries is a nonprofit organization that forms, informs, and transforms people of faith by offering programs and resources to assist in their commitment to build a more just and peaceful world. They strive to prepare people of faith for the call of the Gospel to help heal the world and experience a deeper faith and more fulfilling life by doing so. Since 2001, over 50,000 people have completed a JustFaith Ministries program. A quote from Jack Jezreel, their founder, on the organizations goals: “We change people – and people change the world.” To access their website and learn more, click here. The food that we eat can have a huge impact on the environment. The Good Food Toolkit is helping congregations to find food that is both produced sustainability as well as raised humanely, and is economically sound by providing the food producers with a livable wage. These are all areas that we sometimes overlook when it comes to purchasing our foods, but The Good Food Toolkit helps to identify each of these areas to help improve the quality of food we are purchasing. To check out the full version of The Good Food Toolkit, click here. For a summary of how it works, as well as an explanation of it by its creators at John Hopkins University, check out this link. GreenFaith is an organization that seeks to spread environmental stewardship to people of all faith communities. They provide resources, education, and positive outlets for how various faith groups can help better themselves and their environments. To check out some of their resources, which can be used at a group level or an individual level, check them out here. To check out their homepage and learn more about their mission and goals, clink this link.